Since they were discovered over 100 years ago, X-rays have become the most widely used non-destructive tool for imaging in medicine, industry and research. Over this period, conventional imaging or radiography with X-rays was entirely based on absorption as the mechanism for contrast formation. However, based on deep physical insight, Dr Wilkins and his CSIRO colleagues showed how conventional radiography could be extended to yield a second realm of information via the refractive properties of X-rays, thereby greatly increasing the applicability of X-rays to the study of weakly absorbing features, such as those relating to soft-tissue. This work arguably constitutes the most fundamental physics-based advance in the exploitation and interpretation of X-rays for imaging in medicine, industry and science, since the pioneering work of Rontgen in 1895. This insight and the related methods for implementation have been adopted in a wide range of scientific, industrial and biomedical applications including some clinical applications. Patents filed by Dr Wilkins and colleagues, led to the formation of a local company, XRT Limited. Key ideas are also embodied in the conceptual design of the Imaging & Medical beamline at the Australian Synchrotron. For their contributions to this field Steve Wilkins and colleagues were awarded a CSIRO Medal for Research Achievement in 1998. In late 1995 the 100th anniversary of the discovery of X-rays was celebrated. It was on the 8th of November 1895 that Wilhelm Conrad Rontgen, while investigating the properties of electrical discharges through evacuated glass tubes made his famous first observation of ‘X-rays’ as he called them. In the next seven weeks of intensive activity, eating and sleeping in his laboratory, Rontgen methodically explored nearly all the basic properties of X-rays which were amenable to investigation with the equipment he had available in his laboratory. Among the properties that he investigated was that of the relative absorption of X-rays by different materials. He observed that nearly all proved transparent to X-rays to a greater or lesser extent. In particular, in an epoch-making series of experiments, Rontgen firstly held his own hand to the invisible radiation and saw the shadow of his living bones on a fluorescent material and subsequently on photographic plates. When he got the exposures right he called his wife Bertha into the lab and in a 15 minute exposure recorded the famous image of her left hand showing her wedding ring ‘floating’ around the bone of her third finger. From those simple beginnings, X-ray radiography has become one of the most widely used non-invasive diagnostic tools in medicine, science and industry. Over the past 100 years or so since its discovery, the basic physical mechanism for practical X-ray imaging has been based on the narrow assumptions of absorption contrast and the interpretation of image structure based on straight-line propagation of X-rays (i.e. ray optics). In this view, image contrast results from differential absorption in the object due to its varying composition, thickness or density. In such images, dense material, such as bone, is shown clearly, but there are severe limitations in the imaging of weakly absorbing and fine features, such as occur in soft biological tissue and in some materials-science samples. The revolution afforded by X-ray phase-contrast imaging is that it can provide a further ‘dimension’ for X-ray imaging/radiography and tomography involving the exploitation of both purely refractive effects (such as are readily seen for visible light) as well as wave optical interference effects (diffraction), to produce new or additional contrast in the image of an object. The contributions of Steve Wilkins and the CSIRO X-ray Team in this area involved new insights as to how X-rays can be used for practical phase-contrast imaging as well as the design of related instruments. This work arguably constitutes the most fundamental physics-based advance in the exploitation and interpretation of X-rays for imaging in medicine, industry and science, since the pioneering work of Rontgen. So what did CSIRO do? quantitative information on a sample can be obtained from image intensities even with polychromatic X-ray image data. An attraction of X-ray phase-contrast imaging is that it can provide much greater sensitivity to fine-scale or weakly absorbing features that produce little or no contrast in a conventional X-ray image, e.g. the hairs on a human arm. Phase contrast can greatly enhance the visibility of edges and boundaries within objects, relative to that available from conventional absorption-based methods. In addition to developing the physical basis and instrumentation for greatly improving the qualitative information available via X-ray imaging, theoretical methods have also been developed by the X-Ray Team at CSIRO to extract quantitative information from the phase-contrast X-ray images. The Team has demonstrated the effectiveness of the techniques in a wide range of industrial and life-science X-ray imaging applications and in X-ray microscopy at sub-micron resolution. The journal cover below shows one example: a phase-contrast image of a finger bone (proximal phalanx). The phase-contrast imaging technology developed by CSIRO is being commercialised by the Victorian spin-off company XRT Limited, established for this purpose, and some developments are being marketed under licence from XRT by Gatan Inc. Ideas developed in the course of CSIRO’s work are also a key feature and provide guiding principles in the design and development of the X-ray Imaging and Medical beamline at the Australian Synchrotron. A variety of methods for X-ray phase-contrast imaging have been explored by the CSIRO Team. These fall into 4 main classes, namely crystal-based, aperture-based, propagation-based and grating-based methods. A brief description of some of these is given below. Perfect crystals, such as can be obtained with semiconductor-grade ingots of silicon, provide high reflectivity X-ray optics operating over a narrow angular range for a given X-ray energy. They operate by Bragg diffraction. One early idea of the X-ray group was to design and manufacture an integrated collimator-analyser configuration for X-ray imaging applications. The analyser crystal acts as an angular filter selecting out only a narrow angular direction of refracted radiation from a collimated beam. On the morning of the day on which they planned to carry out their first experiment, Steve Wilkins was trying to think of a suitable sample while jogging around Blackburn Lake Sanctuary near his home. An obvious choice that came to mind, which both approximated a phase object with sharp interior structure and also had some national character, was a eucalyptus leaf from a small tree. On his jog that morning, he picked one such leaf from the lakeside and the same day Andrew Stevenson and Dachao Gao set up the first experiment. They made a 5 h overnight exposure which provided an image that contained a very dramatic outline of the vein structure in the leaf and not much else (see figure below). This was a memorable scientific moment. Here was hard X-ray phase-contrast imaging in very stark form! A few days later Steve Wilkins gave a talk to an internal Science & Technology Review in the Division and showed the image at the end of his talk and tried to point out its scientific significance. When asked by the then Chief what practical things the techniques could be applied to, in a mild state of euphoria, he replied everything. On 16 August, 1993, a provisional patent was filed relating to a variety of designs for integrated X-ray optical devices for use in imaging. A flurry of activity ensued and a number of papers on crystal-based methods emanated from the group following this initial work including a Letter to Nature published in February 1995.
severe alignment and stability requirements. In order to try to overcome these limitations, the CSIRO Team turned towards trying to think of ways of using more of the X-ray flux emitted by a conventional tube source than was the case when using perfect crystals. Various different polychromatic imaging approaches were considered and patented. These all involved using some special X-ray optical devices between the source and detector, and might generally be described as Schlieren-type (wavefront shearing) methods. Some time earlier (around 1993) the CSIRO Team had carried out some imaging experiments on thin slices of wood using a microfocus X-ray source and a large magnification. They observed some puzzling contrast which varied with distance. They thought that this was a manifestation of interference effects (Fresnel diffraction arose, but was not pursued in detail). A concern at the time was that the X-ray source was spectrally ‘dirty’ and that the microfocus spot was moving, and therefore likely to smear out wave interference effects. In a moment of insight, occurring around early 1995, it became clear that for the conceptually simple approach of in-line imaging, (involving a point source and significant magnification), it was spatial coherence (source size/collimation) rather than chromatic coherence (spectral purity) that was primarily relevant for obtaining significant phase-contrast information in in-line images. Moreover, the mechanism of contrast formation was simply Fresnel diffraction based on free-space propagation of an electromagnetic wavefield. Thus, after having pursued various much more complicated approaches to X-ray phase-contrast imaging involving different types of X-ray optics, the Team came back to a very simple approach involving essentially no X-ray optics and based on free-space propagation. These ideas might have been propounded any time in the previous hundred years, but apparently had not! although refractive effects were usually very small for X-rays interacting with objects, the effect (i.e. angles) could become greatly amplified near an edge or boundary between regions of different refractive indices. the occurrence of intensity variations or interference fringes in an image due to such edge effects did not, to a first approximation, depend on X-ray energy. This was an important insight by the CSIRO Team which essentially opened up practical X-ray phase-contrast imaging. Guided by these insights, the Team carried out some simple experiments using their microfocus source and a ‘bubble sample’ used earlier in the crystal-based experiments and observed the signature ‘black-white interference fringe’ which would only appear when the object-image distance was large and disappeared, as expected, in contact mode. A key feature of the experiments was that the Team was deliberately using a polychromatic X-ray source and just relying on the object to act as the origin of contrast with no X-ray optical devices whatsoever being involved (see Figure below). These new results served to confirm the underlying (Fresnel diffraction) mechanism for the earlier work (1993) in which they had observed contrast to vary with object-image distance in images of thin wood samples and had postulated Fresnel diffraction as the operative mechanism. A key feature of the in-line method was the pivotal role of source size, and in particular that phase-contrast imaging effects only became important in a typical projection radiographic case when source size was around 40 microns or less. The in-line or propagation-based approach to phase-contrast imaging was much simpler than other methods considered and well-suited to practical applications. It resembled the method of in-line holography developed by Gabor in 1948, but operating at much shorter wavelengths. On the experimental side, the X-ray Team carried out a number of detailed studies including the study of a small goldfish (see figure below) which led to the cover image of Nature (1996, 384: 335-338). A provisional patent application was filed in February 1995. 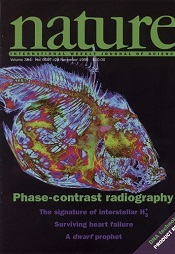 Some time later, a related Letter to Nature was submitted with the title ‘Phase-contrast imaging with polychromatic X-rays’ and appeared in a November 1996 issue. This has become a seminal work in the field of propagation-based X-ray phase contrast imaging with over 500 citations to the beginning of 2010. A key feature was that it did not require the use of a synchrotron type source or a monochromatic source. X-ray phase-contrast imaging has now become a widely used technique both using laboratory based systems as well as synchrotron-based ones and is finding wide ranging application in industry, research and in an early stage for clinical medicine. CSIRO’s research in the field has led to the formation of the Australian company, XRT limited and has contributed to the Imaging & Medical beamline at the Australian Synchrotron. For their contributions to this field Steve Wilkins and colleagues were awarded a CSIRO Medal for Research Achievement in 1998.